SAFRAIL™ industrial fiberglass handrails are commercial railing systems for stair rails, platform/walkway handrails and guardrails. SAFRAIL™ systems are fabricated from pultruded fiberglass components produced by Strongwell and molded thermoplastic connectors. The railing systems are particularly well-suited to corrosive environments like those found in industrial, chemical and wastewater treatment plants as well as commercial structures with urban and salt air corrosion. Ease of Assembly - SAFRAIL™ is produced in lightweight standard sections that include both post and rail. Systems can be prefabricated in large sections and shipped to the site or fabricated and installed on-site with simple carpenter tools. Internal Connection System - All connections fit flush, resulting in a pleasing, streamlined appearance. The internal connections allow the construction of continuous handrail systems around circular tanks without special fittings. Safety Features - SAFRAIL™ systems come in a “safety yellow color”, feature low electrical conductivity for worker safety and exhibit high strength. Systems meet federal OSHA standards with a 2:1 factor of safety with a 6-foot (1830mm) maximum post spacing. SAFRAIL™ systems also comply with international standard AFNOR NF E 85-101. Low Maintenance - Molded-in color plus an optional tough polyurethane coating will outlast aluminum or steel systems and requires virtually no maintenance. Cost Effective - Fiberglass components and an easy-to-assemble design provide savings on labor and maintenance, resulting in long-term savings and eliminating the cost and inconvenience of "downtime for repairs" in plant operations. Strongwell recommends that an industrial-grade polyurethane coating be applied to the finished handrail and/or ladder cage for additional protection against fading in outdoor applications. Standard SAFRAIL™ handrail systems are unpainted; the polyurethane UV coating must be requested when ordered. A polyester resin system is standard for the SAFRAIL™ handrail systems but other resin systems are available upon request. 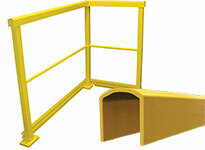 SAFRAIL™ handrail and ladder systems are produced in a standard safety yellow color. Other colors are available upon request. SAFRAIL™ handrail and ladder systems are produced with your choice of standard round and square rails. 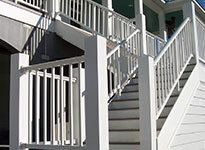 The square fiberglass handrail system is ideal for any high traffic area where handrail is needed. The handrail system meets OSHA strength requirements with a 2:1 factor of safety with 6-foot maximum post spacing. Internally bonded fiberglass connectors result in no visible rivets or metal parts. 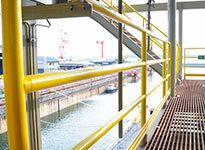 The handrail system includes a UV inhibitor for additional resistance to ultraviolet degradation and corrosion. The square handrail system is the most commonly used system because it is the most economical industrial handrail and easily fabricated in the field. The round fiberglass handrail system is ideal for any high traffic area where handrail is needed. The round rails are easy to grip and 90º molded corners eliminate sharp edges. The handrail system meets OSHA strength requirements with a 2:1 factor of safety with 5-foot maximum post spacing. Internally bonded fiberglass connectors result in no visible rivets or metal parts. 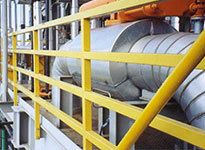 The handrail system includes a UV inhibitor for additional resistance to ultraviolet degradation and corrosion. The round handrail system is commonly used in food and agricultural environments due to very little dust and debris accumulation. SAFRAIL™ channel top industrial fiberglass handrail is an economical commercial railing system designed for long runs on platforms and walkways. The railing system is designed for fabrication efficiency and is not particularly well-suited for stair rails with twists and turns. SAFRAIL™ channel top can be used in combination with round and square SAFRAIL™ as needed. Standard SAFRAIL™ channel top handrail systems are pultruded using a polyester, fire-retardant resin systems. The handrail system includes a UV inhibitor for additional resistance to ultraviolet degradation and corrosion. Standard color is yellow, however, other colors are available upon request. The channel top handrail system meets OSHA strength requirements. It has also been independently tested and meets the British Standard EN ISO 14122-3:2001 requirements. The handrail system sustained a falling weighted bag impact force of 216.5 ft-lb (293.6 N-m). STRONGRAIL® architectural railing and fencing systems are a strong, attractive, and safe solution to your structural needs. The standard systems are fabricated from pultruded fiberglass components produced by Strongwell and molded thermoplastic connectors. The railing systems are particularly well-suited to corrosive environments such as those found in commercial structures with urban and salt air corrosion. Systems can be made to meet ADA requirements, adding safety and beauty to your property. Strongwell’s custom fiberglass railing systems are designed to fit a wide variety of applications and, because they are standard systems, to be cost effective. 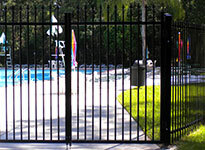 However, custom railing systems are available to suit special needs. 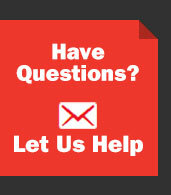 Following are some examples of custom railing from Strongwell. SAFRAIL™ is typically produced in the standard "safety yellow" color. However, other colors can be customized to your project. A heavy duty railing system that uses 2" x 1/4" EXTREN® square tube built to ASTM F-1092-98 specifications is also available for applications requiring added stiffness for less deflection under normal loading. Strongwell designed a vertical rail system for the Indianapolis Wastewater Treatment plant that used less material and therefore, was more cost effective than conventional horizontal aluminum or fiberglass railing systems. The custom handrail was built to meet requirements that spacing between rails be less than 6".